Many moons ago, I posted about stitching this cosmetic wallet. After many hours (and a considerable amount of wrestling with Adobe Illustrator! ), the PDF pattern is at last 'shop-ready'. Of all the projects I have designed, this remains one of my favourites. It incorporates some things that I love to work with: linen, embroidery, botanical fabrics, and a vintage buckle. I was aiming to replicate the ethereal feel of antique French monogrammed linen with this project. The wallet is able to be folded for travel, and unfolds (above) to hang conveniently for easy access when you reach your destination. and an elasticised lipstick keep. I made the wallet from a jelly roll of Moda's fabric range 'Etchings' by 3 Sisters which conveniently has a very French feel about it. I especially enjoyed the embroidery on this project. 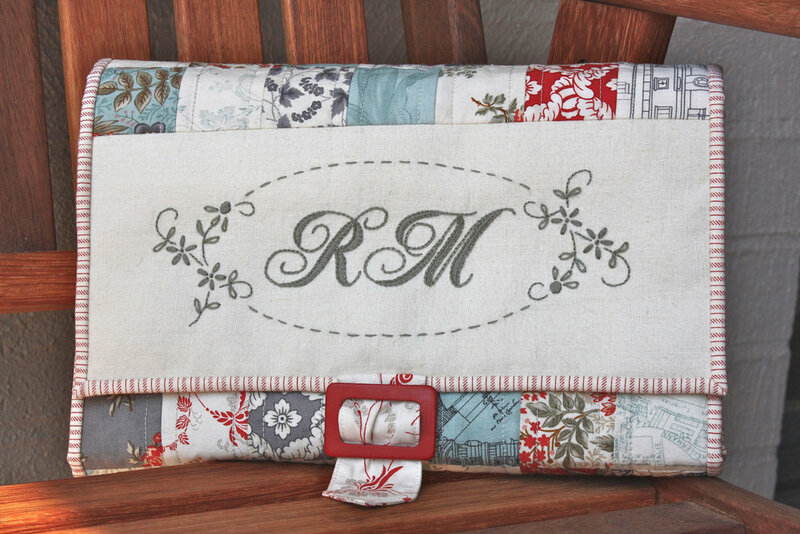 The pattern includes a full alphabet for personalising your monogram. Writing this pattern up was quite a task, and the instructions are very detailed which is reflected in its higher price. The tone and meaning I was hoping to convey by calling this pattern 'Coquetterie' was variously: ‘vanity; concern for one’s appearance; a knack for fashion; flirty; playful behaviour'. So flirt and play to your heart's content with this pattern.